We’d love your help. 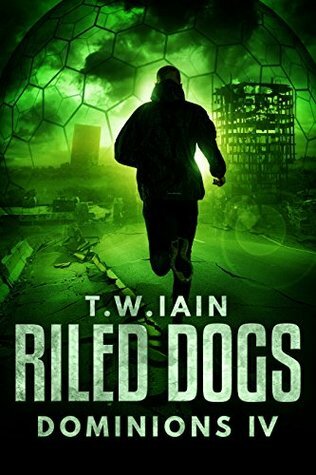 Let us know what’s wrong with this preview of Riled Dogs by T.W. Iain. Genna can’t let her guard down, even for a moment. Running a district is hard work, and there are always those determined to undermine her. And now she has a fugitive from the Dome to protect, someone who is still seen as a threat to be neutralised. Then there is her old enemy to the east, an enemy who appears to have new, worryingly po The only certainty in life is death. Then there is her old enemy to the east, an enemy who appears to have new, worryingly powerful weapons. Already, the dog is snapping at her heels. Genna knows that is it only a matter of time before he attacks. To ask other readers questions about Riled Dogs, please sign up. Married, kids, job; the usual stuff. But there has to be more. Music, and books. Especially books. Fuel for the imagination, energy for the mind. When I was younger, I’d go outside ‘to play’, but I’d take a book with me, find somewhere to sit, and read. I can recall holidays not through what happened, but through the books I read at the time. But it’s never one-way. All those stories, all those idea Married, kids, job; the usual stuff. But there has to be more. Music, and books. Especially books. Fuel for the imagination, energy for the mind. But it’s never one-way. All those stories, all those ideas – they ferment. They build up, and they need a release. TW Iain is the part of me that acts as a release valve. TW types away, crafting tales to put out into the world. There are Dystopian thrillers (the Dominions series) and sci-fi horrors (the Shadows series). And then there’s the short fiction, in anthologies and on twiain.com. The website also allows an output for various musings on books and anything related to them. But mainly, there’s the fiction‌—‌the stuff already out there, the stories in process, and the ideas that may, one day, grow to become new stories. And all these stories (the ones I write and the ones I read) spawn new ideas, which ferment and grow into their own stories.